Ten years ago, I traveled with my husband Logan to the 12th ICEM conference in San Francisco. At the time, I wore a boot on my left foot to heal a stress fracture. That boot turned out to be the perfect conversation starter for an introverted young playwright nervous to talk to a group of well-regarded international physicians. I received tip after tip for preventing future stress fractures, my favorite being the advice from a Scottish physician to balance on one foot while I brushed my teeth to build up the foot muscles. And yes, he demonstrated the maneuver for me. Two years later, we were off to the ICEM conference in Singapore, followed by the EuSEM meeting in Stockholm that fall. The next year it was MEMC on the Island of Kos in Greece. We flew into Izmir, Turkey, rented a car and drove to Bodrum (stopping for roadside figs along the way), then sailed to the Greek island to celebrate emergency medicine at the home of Hippocrates. 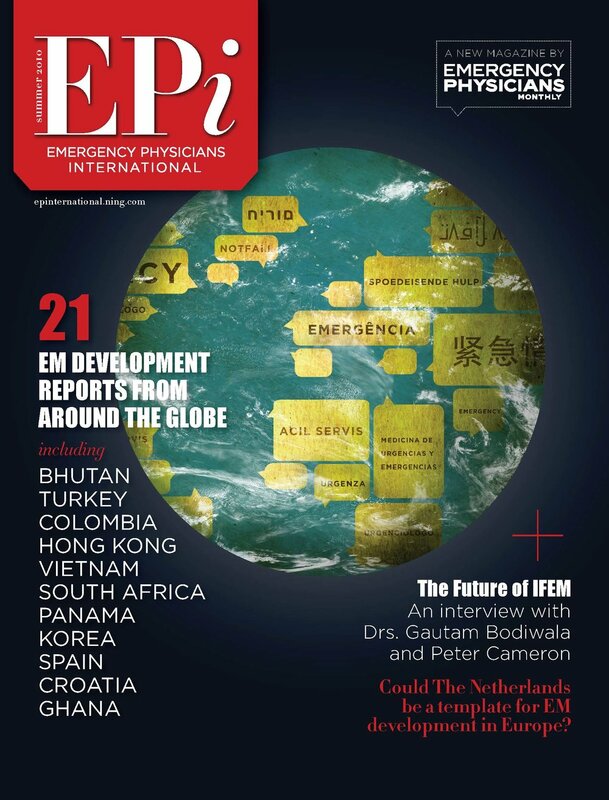 It was in 2012, attending ICEM in Dublin, when I realized that I no longer needed a boot to start a conversation with global emergency physicians. I was sharing a pint with a group of South African and Latin American doctors and it hit me just how much I loved hearing their stories. In some ways, the awe had subsided. Once they seemed like superheroes to me, demigods who traveled the world fighting death and sickness. In other ways, my awe had grown as I had come to understand that these were just people, people who struggled and worked hard and fought exhaustion and fatigue and burnout and bureaucracy. Yes, I do. I want to tell the stories of the doctors working remotely without access to expensive medical equipment and tests. I want to tell the stories of the female doctors joining the specialty for the first time in countries where that was previously unheard of. I want to tell the stories of countries developing their EM system, and the stories of more developed EM societies trying to change their systems. I want to tell your stories, and I need your help to do it. Write to me, call me, skype me, let me ask you questions. Share your personal stories. Share what’s hard. Share what’s good. Share what you think needs to change. Help me understand your worlds and help us get this right. Laura has more than a decade of experience as an editor, writer and playwright. Her writing has been published in an anthology of Brooklyn poetry, and in national literary journals. Laura received a Masters in Applied Theater from the City University of New York, with an emphasis on community storytelling.